In these kinds of situations, a new coat of paint can really save the day. As absurd as it may sound, updated paint truly can give your home the facelift it deserves — and without the cost of ripping out flooring, installing new kitchen countertops, or redoing your bathroom. One of the most prominent ways people find to update their home without completely ripping it apart is by starting on the outside. A new coat of paint on the exterior of your home can totally transform it, making it more inviting and greatly raising its curb appeal. It doesn’t matter whether your home is wood, stucco, or brick, refreshing the tired current paint and even choosing a fresh new color will make it look like a totally new house. While it may seem unbelievable that updating the interior wall paint of a home could make a huge difference in its appearance, the difference between freshly-painted rooms and stale, older ones is night and day. Just as decor and furniture go out of style, so do paint colors. The faded Pepto-Bismol pink of your bathroom may have seemed charming six decades ago, but today, that same bathroom would look much nicer painted in soothing blue or green. The once-cheery yellow kitchen walls now simply seem tired; a sophisticated-yet-subtle gray will breathe a whole new life into your kitchen. 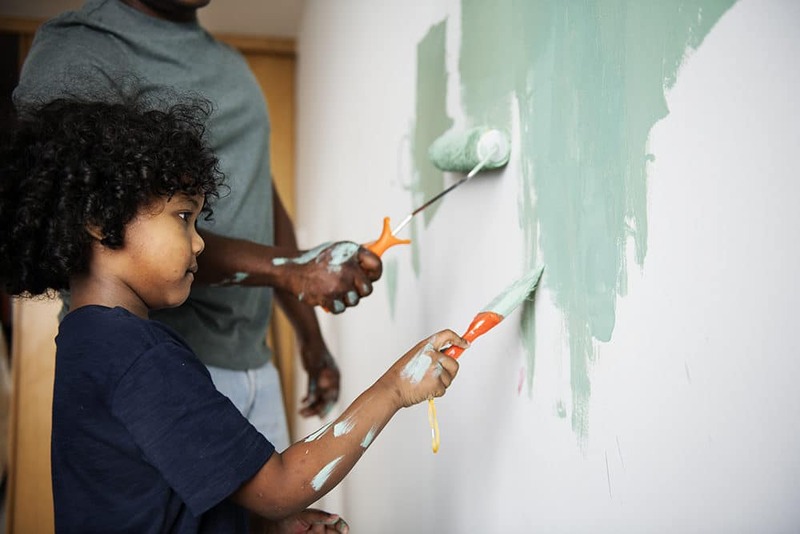 Repainting walls isn’t just about updating colors, however; it’s also about repairing small dents, dings, and scuffs that make your home look dingy and dirty. You’ll be shocked at the difference it makes when walls in high-traffic areas are smoothed over and repainted; your home will feel brand-new again! Once all the damage is repaired, all you’ll have to do is plan for occasional paint touch-ups to keep things looking amazing. You’ve been dreaming of a new kitchen … but your bank account isn’t prepared for that yet. In the meantime, why not give your kitchen cabinets a makeover with a new paint job? If you’ve got wooden cabinets, this works particularly well. If you’re also repainting the walls, you’ll have a kitchen that looks amazingly refreshed when you’re finished. Who knows — by the time you do save up enough for a new kitchen, you may just decide to keep those current cabinets, after all! A new coat of paint isn’t only limited to your house itself; you can also target furniture and breathe new life into it by repainting it. Take a look around your home to see what items could use a makeover. That wooden armoire in the bedroom, perhaps? What about the antique sideboard in the dining room? Your daughter would likely be delighted if you updated the dresser in her bedroom by painting it in her favorite color. Rather than tossing out old items, painting it is a DIY project that will make you feel like you have a house full of new furniture. Picking new paint colors can be stressful, but there are a couple of ways to make it less so. The first is to keep color psychology in mind so you can plan out the way you’d like specific areas of your home to make your family and visitors feel. Blue is calming and soothing, for example, while yellow is warm but can be quite stimulating. You should also use SureSwatch to make sure you’ve got the right hue before you even pick up a paintbrush. It’s an effective way to see what a color will look like on that wall, cabinet, or armoire before you’ve committed yourself by painting it on. With colors confidently chosen and the painting job done, you can kick back and relax in a house that suddenly seems new — all thanks to a new coat of paint. Best of all? With your house and furniture transformed, maybe you can spend the cash you were saving for remodeling to go on an exciting vacation, instead! For more painting advice, tips, and tricks, be sure to check out the SureSwatch blog!